One of the things that often struck me during my career as a civilian bureaucrat in the Defence Department’s capability development area was the relatively limited amount of public debate about our future armoured vehicle capability compared to our future air combat and submarine capabilities. That’s a shame because that debate has on occasion prompted Defence to explain the reasons for its capability investments more fully and convincingly to the taxpayers who are both funding those investments and hopefully benefiting from the security they provide. Because the investment in LAND 400 is bigger than the budget for AIR 6000 Phase 2A/2B (the joint strike fighter program), I thought it would be worth encouraging a little public debate to confirm whether the government and Defence are on the right track. So it’s good to see that my piece in The Australian (reproduced in The Strategist ) has prompted a response  from Senator Jim Molan. But if I may press my original armoured knight analogy a little further, I’m not sure my article is the windmill Molan is tilting at. I’ve often argued that the great disjuncture in our strategic defence policy since the Vietnam War is that we structure the force for the defence of Australia (whether that term is explicitly used), but then deploy the army, which we have fundamentally underinvested in, far offshore. So I agree with what I think is at the core of Molan’s argument—that we don’t invest in providing the Australian Army with the capabilities it needs to do what we ask it to do. But that doesn’t mean I agree with him on the solution. Nor do I think Molan paraphrases my argument correctly. Despite his claim, nowhere did I say Defence should ‘jettison’ armoured fighting vehicles (AFVs). I am on the record  as saying the government’s decision to acquire the Boxer combat reconnaissance vehicle was a good one, made for the right reasons. Despite Molan’s claim, nowhere did my piece say we should get rid of tanks. My argument specifically addresses LAND 400 Phase 3, which is intended to acquire around 450 infantry fighting vehicles (IFVs), at a cost of $10–15 billion, in addition to the $5.2 billion being committed to purchase 211 combat reconnaissance vehicles in Phase 2. And even on IFVs, I didn’t say we shouldn’t get any, and acknowledged there are scenarios where they would be necessary. My argument is about the balance between investment and opportunity cost. I suspect Molan and I have much more in common than he may care to admit on the issue of opportunity cost. As I pointed out in the ASPI report on the 2018–19 defence budget , the future submarine project appears to be distorting the balance of investment (chapter 6) in Defence’s capability plan. And we are likely to have spent around $20 billion (page 22) between the future submarine and future frigate projects before they deliver any operational capability. But just as shipbuilding has the potential to distort Defence’s overall investment program, so LAND 400 Phase 3 has the potential to distort the land component of the program. LAND 400 locks up a lot of money for well over a decade—a decade that will be marked by fundamental technological change. As Molan argues, it’s important to align strategy with tactical capabilities, but the converse is also true. He points out many of the tactical abilities of AFVs, but I have never seen the golden thread of logic that links a land force structure dominated by that capability to our strategy. That’s the discussion we need to have. A balanced investment program should recognise the limitations as well as the strengths of IFVs. The US lost large numbers  of Bradley IFVs in the second Iraq war fighting an insurgent enemy. The LAND 400 solution will be technologically more advanced than the Bradley, but future threats will be too, particularly those posed by a conventional military. With 211 Boxers on order  (a vehicle that some militaries regard as an IFV), it seemed like a good moment to stop and take a deep breath and confirm whether acquiring all 450 Phase 3 IFVs is the best solution to Defence’s capability requirements. However, since my original piece, Defence has released the request for tender for Phase 3 (all 450 megabytes  of it! ), indicating that heavy investment in AFVs is indeed Defence’s ‘prevailing wisdom’. And yet we’ve also seen the new Chief of Army, Lieutenant General Rick Burr, publish his ‘Accelerated Warfare ’ concept, in which he acknowledges the disruptive threat posed by a range of emerging technologies. He notes, for example, that ‘swarming low-cost technologies are increasing the vulnerability of major military systems’ and urges the army to think of creative responses. 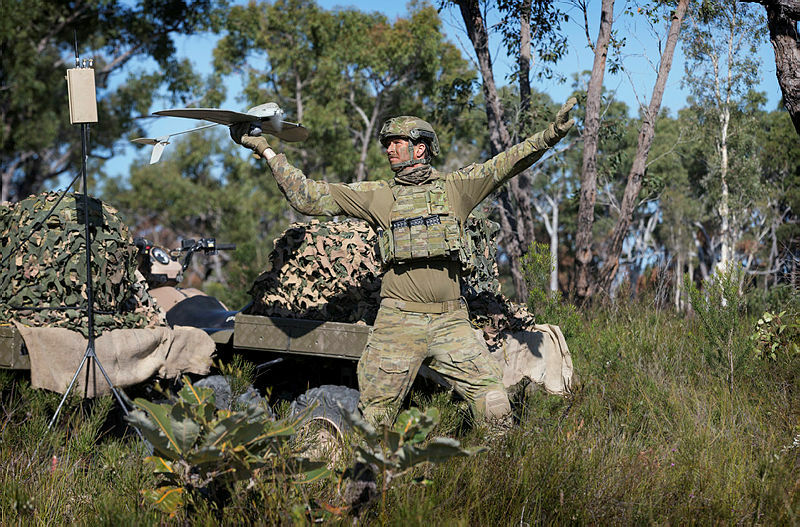 Next week I’m off to the Land Forces conference  in Adelaide to see how the army and its industry partners are developing those creative responses. Hopefully they’ll be able to do it despite a very large chunk of the army’s investment budget now being locked up. I’d be very happy to continue the debate with any of our readers there. Marcus Hellyer is APSI’s senior analyst for defence economics and capability. Image courtesy of the Department of Defence.